Call Me Survivor tells the stories of women who have persevered through battering, humiliation and fear to come out stronger and empowered to live lives of quiet triumph. The author is founder and executive director of Seraphim Manor, a transitional housing facility for battered and abused women in Southern California. She spend much of her time facilitating workshops and seminars particularly structured to assist clergy and church leaders in appropriate counseling and Scripture interpretation to best assist the victim and ensure accountability of the perpetrator. 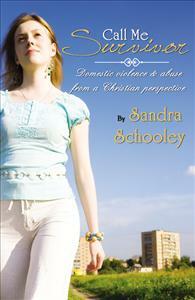 Sandra is a survivor herself and you will find her own story within Call Me Survivor. She is an unabashed evangelical Christian and continually strives toward becoming the Imago Dei (image of God) in her personal walk. This book really hits home for a lot of women. It gives you hope and you know life does not always have to remain the same. There is away out of abuse if anyone wants out. This book is for everyone to read! It will enrich your understanding of how God delivers woomen from abuse. It will also empower you to help others. This is a must in your readings!!! I found the stories of the men and women who have survived horrible abuse to be shocking and compelling. I believe the best way to recover from such degradation can only come by giving it to God.